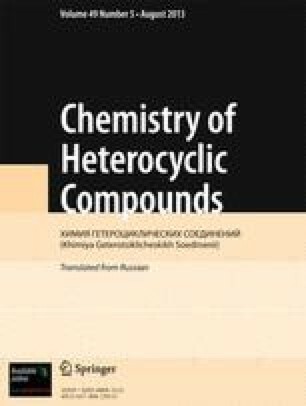 The reaction of 3-chloropropenyl alkyl ketones or 2,3-dichloropropyl alkyl ketones with 2-substituted ethylamine derivatives leads to the formation of the hitherto unknown 1-(2-R-ethyl)-2-alkylpyrroles. Translated from Khimiya Geterotsiklicheskikh Soedinenii, No. 8, pp. 1047–1049, August, 1990.